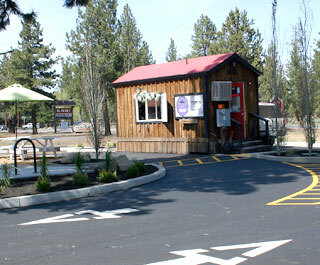 The popular Huckleberry Bush coffee kiosk is back in business. The owner, Tiffany Adrian, at the end of her first week said, "We had a great turnout and our grand opening was quite successful." This kiosk on wheels had been parked in the precarious traffic lane off Highway 20 in front of the Shell station. Cars occasionally rammed the structure, so a better location would have been desirous, but the kiosk was there when she bought the business in March 2014. A few months later, the owner decided to tear down the Shell station, dig up the fuel tanks, and put the one-acre property up for sale; so the kiosk had to go. Adrian was told in August that she had until October 31 to tow it away. The winds of fortune shifted in her favor when the new owners of Three Wind Shopping Plaza (Dickerhoof Properties, Penn St. LLC) asked if she would be interested in putting her kiosk on the property between Takoda's and Highway 20. She didn't have to think twice about that offer, and has been patiently waiting while permits have been approved and the vacant lot has been improved and landscaped to accommodate a pad for the kiosk and two-way traffic lanes. Not letting a little thing like having the road pulled out from under her while struggling to support her family (Aidan, 8 and Aela, 5) get her down, this hardy entrepreneur has been attending OSU working on her business degree. She may end up with a whole chain of Huckleberry Bushes before she's done. Adrian is serving favorite coffees, teas, and continuing locally made chai teas and syrups from My Chai in Bend, and her famous Huckleberry Smoothies from 6:30 a.m. to 5 p.m. Monday through Friday and 7 a.m. to 5 p.m. on Saturdays and Sundays. Food service will consist of homemade paninis with gluten-free choices made fresh daily, as well as fresh-made salad specials with house-made dressings, baked goods and homemade hot and chilled soups to serve this summer. Parents can pre-order fresh, healthy school lunch sacks to pick up before 5 p.m. or before school.